I think these two questions are related, and not just in the United States. Populist angst is taking hold around the world. Like all anger, it isn’t necessarily rational and may not bring the desired changes, but the anger and frustration are real. People have real problems, and increasingly they don’t trust traditional leaders to solve them. Last week I had the privilege of meeting first privately and then publicly with Peggy Noonan. For those who don’t know, she was President Reagan’s speech writer and is now a Wall Street Journal columnist and celebrated author. As a writer, she is one of my heroes, perhaps the greatest essayist of my generation – a true wordsmith. Back in February, with the presidential campaign in full force, Peggy wrote a column that has been on my mind ever since. She titled it “Trump and the Rise of the Unprotected.” Everyone should read it, preferably several times. It is that good. Whatever you think of Donald Trump, he is a symptom of larger trends. So is Bernie Sanders. A major fraction of the population is living on the edge, vulnerable and unprotected. Most of you reading this letter aren’t in that category; you have homes, steady incomes, and some investment capital. That puts you way ahead of average. Today we’re going to look at the real-world economic pain that so many people experience in daily life. Some of this will be hard reading, but it’s important. Reading it, you will better understand what is going wrong and how badly we need solutions. You may also come away with a better idea of the direction this country is headed if we don’t see real change in the near future. Many establishment types in both the Republican and Democratic parties seem to think that Donald Trump and Bernie Sanders are anomalies. That goes double for the Republican Party establishment class that thinks their money can control things. Trump is not an anomaly; he is a harbinger of a growing frustration that is bigger than corporate donors and super PACs. The protected are the accomplished, the secure, the successful – those who have power or access to it. They are protected from much of the roughness of the world. More to the point, they are protected from the world they have created. Again, they make public policy and have for some time. They are figures in government, politics and media. They live in nice neighborhoods, safe ones. Their families function, their kids go to good schools, they’ve got some money. All of these things tend to isolate them, or provide buffers. Some of them – in Washington it is important officials in the executive branch or on the Hill; in Brussels, significant figures in the European Union – literally have their own security details. Peggy goes on to explain why immigration is such a watershed issue. Many Americans suffered from illegal immigration – its impact on labor markets, financial costs, crime, the sense that the rule of law was collapsing. But the protected did fine – more workers at lower wages. No effect of illegal immigration was likely to hurt them personally. The unprotected came to think they owed the establishment – another word for the protected – nothing, no particular loyalty, no old allegiance. Loyalty and allegiance flow in both directions. Yet somehow we’ve reached a point where the people who make decisions are so separated from the people who pay the cost of those decisions that neither group feels any loyalty to the other at all. This is not a recipe for a stable social order and a thriving economy. I want to take Ms. Noonan’s thoughts a little further. The protected are not just the politicians and bureaucrats who make and execute public policy; they are all the people who, because of their jobs and income, can generally protect themselves from the vagaries and vicissitudes of life. They have the money to hire the lawyers, doctors, mechanics, pay for the insurance, etc., to deal with whatever problems arise. Are you in the protected class? If you’re reading this newsletter, you probably are. At least for now. I do have some readers who are struggling. I read their comments online and sometimes get email from them. For the most part, though, people read me because they have money to invest and want to keep up with economic news. The unprotected have other priorities. I think we have subcategories within the protected class, though. I know some of the top 0.1%, and their lives are not like mine. They have multiple mansions, bodyguards, private jets, chauffeurs, and people to take care of everything. Call them the Super-protected. As for me, I’m just plain protected. I live in a nice apartment with a doorman downstairs. I have assistance to help me with a lot of the “busywork.” I don’t miss any meals unless I’m trying to lose weight. I drive my own well-used vehicle. I don’t rate a private jet, but I can at least fly first class, usually, as my frequent flyer status with American Airlines allows me to be upgraded a large percentage of the time. Another step down are what we might call the “semi-protected.” These are people with secure jobs, college degrees, some money in the bank, and a modicum of leisure time. They have the luxury of wondering where Junior will go to college instead of whether they can even pay for it. Read that again. Yes, nearly half the country can’t come up with $400 cash in an emergency. That’s stunning. The slightest mishap – a toothache, a minor car problem, a hot-summer electric bill – will send them into debt or force them to sell something. I know what it is like to have to juggle creditors to make it through a week. I know what it is like to have to swallow my pride and constantly dun people to pay me so that I can pay others. I know what it is like to have liens slapped on me and to have my bank account levied by creditors. I know what it is like to be down to my last $5 – literally – while I wait for a paycheck to arrive, and I know what it is like to subsist for days on a diet of eggs. I know what it is like to dread going to the mailbox, because there will always be new bills to pay but seldom a check with which to pay them. I know what it is like to have to tell my daughter that I didn’t know if I would be able to pay for her wedding; it all depended on whether something good happened. And I know what it is like to have to borrow money from my adult daughters because my wife and I ran out of heating oil. That’s life on the edge in USA 2016. The data tells us that millions of people live like this or even worse. I should point out that many of the protected were once unprotected. I certainly spent the first 35 years of my life in the unprotected class. I know what it’s like to wake up at 2 AM with your stomach in a knot as you try to figure out how you’re going to make your little two-person payroll, pay the electric bill before they turn you off, get enough gas in the car to make it to your first sales call – and wonder how you’re going to get one of your clients to pay you early so you can do all these things. When you have to borrow money at 18% and your taxes seem god-awful high compared to your income, your views on inflation and government participation change. For many years, as a young businessman, I kept a bank account in North Dakota to write checks on because it took between 7 and 10 days for them to clear. The polite term for that is cash management, but back in the day we called it kiting checks. Today, if I wanted to start a business, I could find a lot of people with a great deal of interest in investing. Back then I couldn’t even get a loan on my own signature. I understand having an old car that requires a lot of maintenance to get you where you need to go. I grew up knowing how to maintain and repair cars, swing a hammer, and do everything else needed to keep my life moving forward. I actually never thought of that approach to life as unusual; it was just normal. But I really didn’t like where I saw our country and economy going. So I can understand the frustration of people who don’t feel that they are participating in the prosperity and growth of the country. I at least felt like I had a chance. As we’re going to see as we go along in the letter, more and more people are feeling that circumstances – and the people who create those circumstance – are arrayed against them. You might respond that even impoverished Americans live better than many others around the world. Maybe so. In some countries the poor and downtrodden simply accept their lot and remain happy. Here, we get angry. Why? I suspect that much of the anger we see is felt by people who thought they would never suffer financially. They were doing well, but then something happened – a job loss, a medical crisis, drug addiction, bad investments, something pushed them down the ladder. Maybe it was their own mistakes, but they don’t like life on the lower rungs and don’t think they should be there. You wouldn’t know any of that to look at me. I like to think I appear reasonably prosperous. Nor would you know it to look at my résumé. I have had a passably good career as a writer – five books, hundreds of articles published, a number of awards and fellowships, and a small (very small) but respectable reputation. You wouldn’t even know it to look at my tax return. I am nowhere near rich, but I have typically made a solid middle- or even, at times, upper-middle-class income, which is about all a writer can expect, even a writer who also teaches and lectures and writes television scripts, as I do. And you certainly wouldn’t know it to talk to me, because the last thing I would ever do – until now – is admit to financial insecurity or, as I think of it, “financial impotence,” because it has many of the characteristics of sexual impotence, not least of which is the desperate need to mask it and pretend everything is going swimmingly. In truth, it may be more embarrassing than sexual impotence. “You are more likely to hear from your buddy that he is on Viagra than that he has credit-card problems,” says Brad Klontz, a financial psychologist who teaches at Creighton University in Omaha, Nebraska, and ministers to individuals with financial issues. “Much more likely.” America is a country, as Donald Trump has reminded us, of winners and losers, alphas and weaklings. To struggle financially is a source of shame, a daily humiliation – even a form of social suicide. Silence is the only protection. I’m no psychologist, but I think psychologists would say that suppressing emotions like shame and anxiety, anger and frustration is terrible for your health. I would bet doing so is part of the reason for the rising middle-age death rate I wrote about last year (see “Crime in the Jobs Report”). Yet I understand why people keep quiet about lifestyle setbacks. Our culture in the US preaches a survival-of-the-fittest “social Darwinism.” We assume people get what they deserve; and if they don’t succeed, it must be their own fault. So it’s no surprise people hide or downplay their misfortune. Gabler is a brave exception on that point. In fact, material success (or lack thereof) tells us almost nothing about a person’s character, values, intelligence, or integrity. Sometimes good, hard-working people have bad luck. Lazy idiots can have good luck. I don’t know why. In either case, bad luck is not what enrages so many people. The unprotected are angry because they believe the game is rigged against them. Moreover, they think the protected class rigged has the game. As bad as the situation is, official data says it’s improving. Just look at the unemployment rate, down to 5% and job openings everywhere. Those numbers look quite different from the perspective of the unprotected. The data doesn’t account for underemployment, lowered wages, and job insecurity. If you spend a few hours cutting your neighbor’s grass for 50 bucks and don’t make another penny, you still count as “employed” that month. Gallup has an enlightening statistic. Their Gallup Good Jobs Index measures the percentage of the adult population that works 30+ hours a week for a regular paycheck. It stood at 45.1% when I checked this week. Last week’s jobs report told us that 62.8% of the civilian noninstitutional population participates in the labor force, and 5% are unemployed, while Gallup tells us only 45.1% have what it considers a “good job.” These aren’t directly comparable datasets, but a rough estimate suggests that maybe a fifth of the labor force is either unemployed or have less-than-good jobs. The picture gets even murkier. Last week my good friend (and onetime business partner) Gary Halbert reported a new survey from the Society for Human Resource Management. Their data says American workers actually feel pretty good. Some 88% of employees said they were either “very satisfied” or “somewhat satisfied” with their jobs. Yet the same survey found that 45% were either “likely” or “very likely” to look for a new job in the next year. So it appears their satisfaction is limited. This survey doesn’t include unemployed workers who also aren’t satisfied with their status. That 5% unemployment number masks a seriously low participation rate, falling productivity, and a serious surge in low-wage service jobs, coupled with a loss of middle-class jobs. It is skewed by the soaring number of temporary workers, involuntarily self-employed workers, and contractors and freelancers in the gig economy who are technically counted as employed. In other words, 5% unemployment today is not your father’s 5% unemployment. There is a reason it feels substantially different. So millions, dissatisfied with the eroding American Dream, struggle to make ends meet, despite a historically low unemployment rate. Merely finding a job, while necessary and welcome, didn’t begin to solve their problems. A May 9 Wall Street Journal story reported some research on this point. 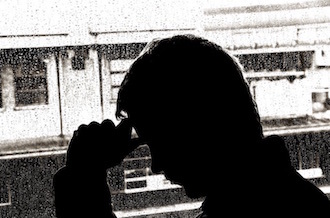 People who lose jobs in a recession experience a variety of long-lasting effects. Their new jobs often pay them lower wages, and it takes years for them to reach their previous earnings peak. These people are less likely to own a home; they experience more psychological problems; and their children perform worse in school. 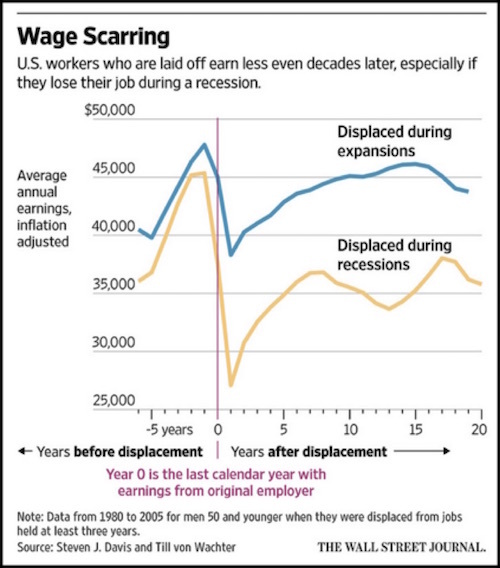 The WSJ calls this phenomenon wage scarring. Only about one in four displaced workers gets back to pre-layoff earning levels after five years, according to University of California, Los Angeles economist Till von Wachter. A pay gap persists, even decades later, between workers who experienced a period of unemployment and similar workers who avoided a layoff. Estimates vary, but by one analysis, people who lost a job during recessions made 15% to 20% less than their nondisplaced peers after 10 to 20 years. It gets worse. At some point these people will reach retirement age with little or no savings. They will either keep working – possibly in jobs that would otherwise go to younger workers – or they will live frugally and depress overall consumer spending. That’s not good for anyone. Think about it. These were probably people who had developed an acceptable lifestyle and were likely saving money and being responsible. Then they lost their jobs, and even now that they’re working again, their pay is still 20% lower than it was. It’s tough to maintain that former lifestyle and still save. And when your house is underwater, selling it and moving down is both difficult and gut-wrenching. Young workers feel a different kind of pain. Too young to have lost jobs in the recession, they reached adulthood in a labor market that doesn’t want them. That is especially true for those without college degrees. The April jobs report showed a staggering 16.0% unemployment rate for teenagers ages16–19. This sample includes only those who were actively looking for jobs, so these aren’t full-time students. They have either dropped out, or they want to work while in school. They probably aren’t happy with the situation, and their parents aren’t, either. In Boston, median asking rents have increased at an annual rate of 13.2% since 2010, far outstripping the 2.4% average annual increase in income. If Boston reflects other cities, we can see why people complain about rent and sleep on each other’s couches. This kind of steep climb in the cost of living is very hard on people who have little income to spare. The following chart comes from Sentier Research (via Doug Short). 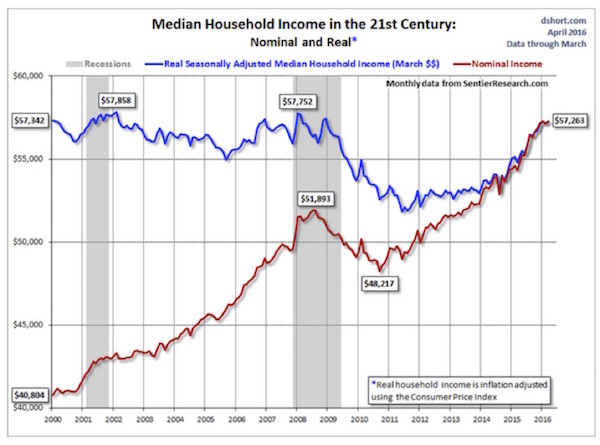 The blue line is real median household income, which now stands at $57,263. That is, half of US households earn less than that. The picture is actually even worse since, as we saw above, the Consumer Price Index understates inflation for low-end households. Nominal wages may be growing – for those who have jobs – but in real terms the unprotected are falling farther behind every year. When I look at that chart, I don’t wonder that half the country is furious at the protected class; I wonder what took them so long. Everything I’ve said about the US applies to most of the developed world. The UK will vote next month on whether to exit the European Union, in part because of the perception that EU policies leave UK workers at a disadvantage. Unemployment rates in Southern Europe are astronomically high, even as refugees pour in from the Middle East. Collapsing commodity and energy prices are hitting Canada and Australia very hard. Yet in all these places, a portion of society is still doing very well. Why is that? One common thread is central bank policy. The Fed, the ECB, and others decided years ago to push rates down and keep them there. Maybe they honestly thought that would help restore growth. It hasn’t, at least not growth that most people can appreciate. Let’s be generous and say the central banks made an honest mistake. Bernanke, Yellen, Draghi, and colleagues all wanted to help people. At some point, you would think they might have to say, “It hasn’t worked.” Maybe they already say it among themselves but don’t tell us because they want to preserve what is left of their credibility. I’m sorry, but at this point there isn’t much credibility left to preserve. The unprotected public has lost faith and is rising up, led by populists and demagogues. The time for wondering where the anger came from is past. We know where it came from, and it’s too strong to stop now. We will all be living on the edge before this is over. Even the protected don’t have unlimited protection. Conservative and Republican establishment types are trying to tell themselves that Trump is an anomaly. Things will go back to normal in time. But if there aren’t major changes – and I’m really wondering how those changes can happen, especially in a Clinton presidency – what do you think the mood of the voters will be in 2020, after the near statistical certainty of a recession within the next four years? Unemployment will once again be high and climbing; pensions will be threatened left and right; and there will be even more people living on the edge. I highlighted a recent study that shows the surprisingly higher death rate among middle-aged whites. That rate is the direct result of increased suicides and abuse of drugs and alcohol – all part of the psychological depression process. And then, while researching today’s letter, I ran across a story in the Washington Post with the intriguing title “Death predicts whether people vote for Donald Trump.” It turns out that there is a direct relationship between the middle-aged mortality rates and the percentage of voters who favor Donald Trump in counties where mortality rates are the highest. That fact becomes more alarming when you look at the context. Over the past decade, Hispanic people have been dying at a slower rate. 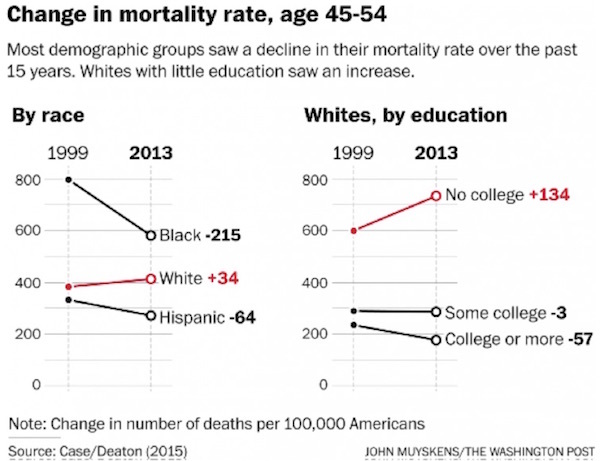 Black people have been dying at a slower rate; white people in other countries have been dying at a slower rate. I think we have crossed a political Rubicon. While money is important in the political process, the unprotected have discovered that their votes are even more important. And that there are more of them than there are of the protected. And that, if you’re in the unprotected class, your vote is not for sale. Anger and frustration are not limited to middle-class voters. They are roiling the ranks of the educated and people you would normally think of as the protected class. There is a growing recognition that the system no longer functions for many Americans. Donald Trump comes along and says he understands and sympathizes with average Americans; and he’s the one who expresses that frustration in terms that a majority of the unprotected can understand. Other candidates may sympathize, too, but what comes out of their mouths sounds like conventional political yak-yak. Whatever you want to say about Donald Trump, when you hear him speak he doesn’t sound like a normal politician. I keep telling people to toss out their old investment models because the underlying economic tectonic plates are shifting under our feet, making our old models spit out unreliable predictions. So too, it’s time to seriously think about throwing out our models for political predictions, because we’re in the middle of what is likely to be an epic generational shift in voting patterns. Past performance is not indicative of future results. Now we have to apply that maxim to our political forecasts as well. That response is generally read as an upper-class Victorian-era conservative reaction to a situation that might threaten his personal status and class. I read that quote now and wonder about the changes looming in our near future. I wonder whether we’ll look back in 10 years and wish we hadn’t wanted things to change so much. – especially when we’re so uncertain as to what the overall outcome of all that change will be. In addition to finding ourselves in the middle of a massive global monetary policy experiment with no clear understanding of what the consequences are, there is a real potential that we may be entering into a period of similar political experimentation. Fasten your seatbelt. These are among the topics we are going to have to continue to explore in the coming months and years. I think they have all sorts of serious implications for our investments and financial planning. I will fly to Abu Dhabi tomorrow evening for a series of meetings and speaking engagements. I was surprised to learn that I can fly nonstop from Dallas to Abu Dhabi on Etihad Airways. That’s one of the nice things about being in Dallas – there are very few places in the world I can’t get to either directly or with one stopover. I will let you know about my experience on Etihad. I then come home and almost immediately go to Raleigh, North Carolina, to speak at the Investment Institute’s Spring 2016 Event. I’m looking forward to hearing John Burbank and Mark Yusko (who will also be at my own conference the same week) and then to being on a panel with them. I also get to meet with my longtime early mentor and friend Bob Mumford, a name from the past that some of you may remember. After speaking in the afternoon, I make a mad dash for the airport, arrive back in the Dallas late Monday night, and make final preparations for my Strategic Investment Conference, where upwards of 700 of my closest friends will gather to discuss all things macroeconomic and geopolitical. It is going to be a great week! If you won’t be going to the conference, you can have the next best thing: recordings of the speakers, delivered just a few days after SIC 2016 ends. You can order your set here. I should note that the price will go up after the conference. A lot. So just jump on this offer now. Speaking of the conference, we have had a few people cancel their registrations for last-minute personal reasons, and those cancellations have opened up a number of spots for those who might like to attend. You can call us at 877-631-6311 to register. It has been an interesting week for me. David Tice reintroduced me to Vikram Mansharamani, the author of the bestseller Boombustology, which is the definitive book on how to spot financial bubbles before they burst. Vikram is now a professor at Yale, but over the years he has held various positions in management consulting, investment banking, and the running of hedge funds. He now focuses on speaking, writing, teaching, and some consulting. He is a fascinating individual, and it is somewhat intimidating to realize that he is only 42. We have a lot of shared friends and not surprisingly share a number of economic concerns. I think I have talked him into coming to my conference this year. I will try to figure out how to plug him in, as you really do want to meet him. What actually happens is that Facebook gives you a choice between male and female and “custom.” In the US, ABC News had so far found 58 options through their diligent research. It gets more interesting, or perhaps confusing. It turns out there 71 gender options in the United Kingdom. I have always suspected that Brits were a little more different than Yanks, and now I have proof. Then again, they may be having a lot more fun than I ever knew about. My youngest (21) son walked through about that time, and I caught him up on our conversation. He looked at us and said, “I can’t deal with this. I’m having a hard enough time with the choice between Clinton and Trump. I simply can’t deal with gender confusion at the same time.” And then he turned around and walked away. Perhaps you can sympathize. The evolution of our social mores over the last 1,000 years has been painstaking but, on the whole, considerable. What was acceptable even in the late Middle Ages – along the lines of killing and torturing for revenge, the marriage of 12-year-olds, and droit du seigneur – is now seen as barbaric and highly illegal. My kids and their friends all think it is perfectly silly that homosexuality was once illegal or held to be immoral. Over time, cultures adapt, and I am sure that with a little bit of bending here and there (pun intended), the Republic will survive. I must tell you, I’m far more worried about monetary policy than I am about gender selection. It’s time to hit the send button. I have a lot of work to do, and I want to actually have some kind of a life tonight as my girlfriend (yes, I have one of those now and have had for quite some time) and I are going to grill some steaks for friends and just chill. You have a great week! May 16, 2016, 11:01 a.m.
Hey, at least the war on the middle class is going well. May 15, 2016, 7:19 p.m.
Great article, closely representing what I m seeing. It’s going to be very interesting seeing how the “middle class” react to the fact that in the current financial enviroment the chances of them living off their savings is a big fat zero. May 15, 2016, 4:07 p.m. In addition to economic stress, many of the same folks feel then they are victims of cultural bullying by the protected. 58 genders, which bathroom would they use :-) The removal of God from the public square, winter break instead of Christmas school vacation, press 2 for English. May 15, 2016, 1:46 p.m. The issue Peggy illuminates is valid. There is a protected class and an unprotected class. However, I would posit that the people who make our laws and run our banks are not the protected class. Donald Trump, Hillary Clinton, Harry Reid, Mitch O’Connell, et al, and even Jamie Dimon, are merely the servants of the protected class. These people may live a protected life but they are not “the protected”. Those people are never seen and perhaps 100 people in the entire world know who they are or what they look like, their servants excluded. Everyone, I mean everyone else, is unprotected. The problem is not solvable unless these 100 or so are IDd. That hasn’t happened in the last 500 years or so and I don’t hear any hard questions being asked these days so, it’s SNAFU in perpetuity or, until our host rejects us. Amerka desreves Donald Trump. Who knows, perhaps the ensuing crisis would wake enough of the populace up to the fact that nothing will change via the current system. Perhaps enough will even reawaken Thomas Jefferson admonition to revisit the constitution regularly, every five years or so, and, you know, even alter or abolish it. May 15, 2016, 12:37 p.m.
Hi John, I appreciate you taking on tough subjects in addition to taxes recently. The US shares the federal reserve policies with other countries as you mentioned, but where we differ is the trillions of dollars in deficit spending on the military and tax cuts for the so-called job creators. That obviously can’t continue unless we are running a sustained surplus. There are three areas not discussed often that assures we will not be competitive. The banking system in the US is really a drug cartel, no different than the ones in Mexico. Practically anyone breathing can borrow money, and people do just like buying heroin. The dependency is fairly recent, since I can remember when layaway was the norm for Christmas and school clothes, and my mom came buy and made payments until it was paid off. There is good debt toward investments that have a positive net value, but nearly all other debt is a waste of money(just like recreational drugs). The other two items are overspending on the military and healthcare. These are much much bigger problems than money spent on so-called social programs—in fact they are true welfare programs (just try to take it away). To be competitive, these two categories really need to be cut in half or more. Just compare how much our competitors spend on military and healthcare. May 15, 2016, 12:03 p.m.
May 15, 2016, 10:27 a.m.
We are reaching a fascinating juncture in history. Technology is eliminating the need for everyone to work, yet we remain in a consumption based economy that needs growth to succeed. The ironies of living in the richest society in history that fails to provide for (and even profits from) the misfortunes of many are coming home to roost.An economic system that grows profits for the “protected” while abandoning everyone else is doomed to Marie Antoinette’s fate. May 15, 2016, 8:45 a.m.
You paint a distressing picture, one that needs improvement before things get even worse. Thank you for highlighting the problem. One thing perplexes me. 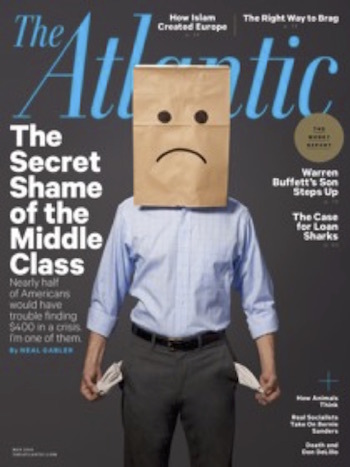 You paint this picture of economic distress and mention the higher rate of inflation for the unprotected. Then you pivot to how central bankers are trying to increase inflation as a means to stimulate the economy. So the apparent solution is to raise interest rates, which will undeniably benefit the financial institutions and bondholders (who have some financial security), but also inhibit economic growth and drive up mortgage rates. I see no logical connection between higher interest rates and decreasing inflation in the unprotected class’ expenses — except possibly by forcing down costs through their pain (e.g. fewer people able to afford medical care). While I can see undesirable consequences in keeping rates low (e.g. people going into reckless and unproductive economic activities), this seems far-removed from the unprotected class that you want to help. Please explain your rationale for implying this would help matters. May 15, 2016, 6:45 a.m.
finding it very insightful in suggesting how society ‘lost touch’ with reality, spontaneous reality. Considering that this eminent historian wrote it back in the ‘60’s, it’s amazing how it applies today with even greater force. May 15, 2016, 5:36 a.m.
many of the ‘protected’ will become part of the other group….as the credit/debt/entitlement/fiat currency bubble bursts with their heads in the sand. i am going to make sure i do not change groups, so i read Mauldin and Armstrong, among others.